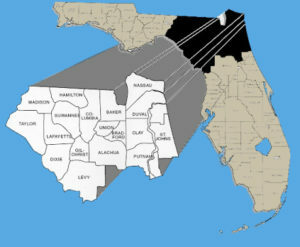 District Two covers the Northeast Florida region including the following 18 counties: Alachua, Baker, Bradford, Clay, Columbia, Dixie, Duval, Gilchrist, Hamilton, Lafayette, Levy, Madison, Nassau, Putnam, St. Johns, Suwannee, Taylor and Union. The major cities include Gainesville, Jacksonville, Lake City, St. Augustine, and Palatka. As a major access gateway with connections throughout Florida and into other states, District Two plays an important role in regional mobility and the state economy. Highway safety is at its best when we can address driver behavior, road conditions and vehicle factors as three interacting aspects of collision and injury prevention. Through events, on-going educational programs, education and action projects, individuals and agencies are combining resources to improve awareness and understanding of safety issues on a local level. Community Traffic Safety Teams (CTSTs) are locally based groups of highway safety advocates who are committed to solving traffic safety problems through a comprehensive, multi-jurisdictional, multidisciplinary approach. Members include city, county, state, private industry and citizens. The common goal of each CTST is to reduce the number and severity of traffic crashes within their community. Multi-disciplinary means integrating efforts of the four “E” disciplines that work in highway safety, including Engineering, Education/public information, Enforcement, and Emergency Medical Services. By combining these various disciplines, the CTSTs help to solve local traffic safety problems related to the driver, the vehicle and the roadway. About Florida’s Community Traffic Safety Teams: For more than 20 years, community-based traffic safety programs have been effective in providing solutions to local crash problems. Community Traffic Safety Programs (CTSPs) were an outgrowth of the successful impaired driving and occupant protection programs of the 1970s and 1980s. Historically, CTSPs combined two or more traffic safety strategies to address local problems such as impaired driving and infrequent use of child safety seats and safety belts. Citizen advocacy groups, law enforcement, businesses, health and education agencies, the courts and the media combined efforts by forming coalitions with elected officials and other community leaders to develop solutions to local traffic safety problems. The first Community Traffic Safety Team (CTST) in the State of Florida formed in 1991 in Polk County specifically to address roadway issues on the Florida Avenue Corridor. Slowly the model expanded and by 1994 there were 15 CTSTs in Florida addressing community issues. On April 28, 1994 the first CTST in District Two (Northeast Florida) was formed in Alachua County. The following year the Duval team was established. The District Two CTSP has been recognized by numerous national organizations including – National Highway Traffic Safety Administration, AAA Auto Club South, American Association of Motor Vehicle Administrators, Davis Productivity – for outstanding traffic safety programs under Andrea Atran’s direction. Today there are 62 teams in the State of Florida. The CTSTs are made up of what is termed the four E’s: Education, Enforcement, Engineers and Emergency Medical Services. All of these disciplines add to the richness of each team and allow broad collaboration in the solving of local traffic safety concerns. To further distinguish Florida and the program, the state has a second group addressing traffic safety concerns: the CTST Coalition. This group meets quarterly around the state to exchange information regarding innovative and unique approaches to traffic safety issues. The attendees share successes and valuable lessons learned from their attempts to solve local problems regarding traffic safety. Visit Florida DOT’s CTST webpage to view all Florida CTST Districts.